The raid preceded the plutonium plant’s shutdown six months later. While this was the end of production at Rocky Flats, the nuclear contamination on this site will remain a permanent danger – in the order of 250,000 years. The Denver Post article quoted above did a fair job of describing the historical significance of the FBI and the EPA raid. The article was less comprehensive about the health effects on local residents, the effectiveness of the cleanup and the on-going threats associated with development and opening access to the contaminated land. This is a serious ongoing public health issue that should not be so blithely dismissed. This weekend (June 6-8 2014) the Arvada Center will host a free series of events “Rocky Flats Then and Now: 25 Years After the Raid”. This event, and the meetings held by the Rocky Mountain Peace and Justice Center before and after the event, will provide an opportunity for raising awareness of the plutonium still on the site, the same plutonium that called for such a dramatic raid 25 years ago. The health effects on local residents have been described in detail by Kristen Iversen, author of Full Body Burden: Growing Up in the Nuclear Shadow of Rocky Flats, and a speaker over the weekend. Also present will be Jon Lipsky, Former FBI agent and leader of the raid team. See the programme of events here. …established cleanup standards that allowed plutonium in the top 3 feet of soil up to 1,250 times background, at a depth of 3 to 6 feet between 25,000 and 175,000 times background level, with no limit on the quantity allowed below 6 feet. Thus, an unknown amount of plutonium remains in the environment at the site. The Cleanup Agreement is based on the assumption that plutonium left in the environment at Rocky Flats will remain in place. But in the unusually wet conditions of 1995 engineer Iggy Litaor’s instruments in soil on the site detected rapid migration of plutonium. In 1996 ecologist Shawn Smallwood found that 18 species of burrowing animals present on site constantly redistribute soil and its contents, including plutonium. In any given year they disturb 10 to 12% of surface soil at the site. Plutonium in soil will not stay in place. Some brought to the surface will become windblown. 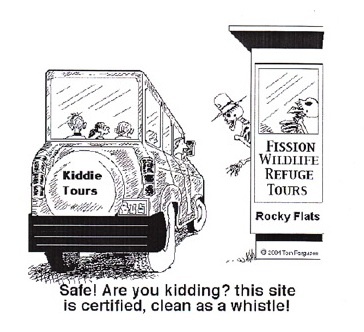 With this in mind, the Rocky Mountain Peace and Justice Center holds that the Rocky Flats site remains unsafe. Meanwhile, plans for new developments threaten to disturb the plutonium contamination. The Rocky Mountain Peace and Justice Center are opposing three new plans for development. 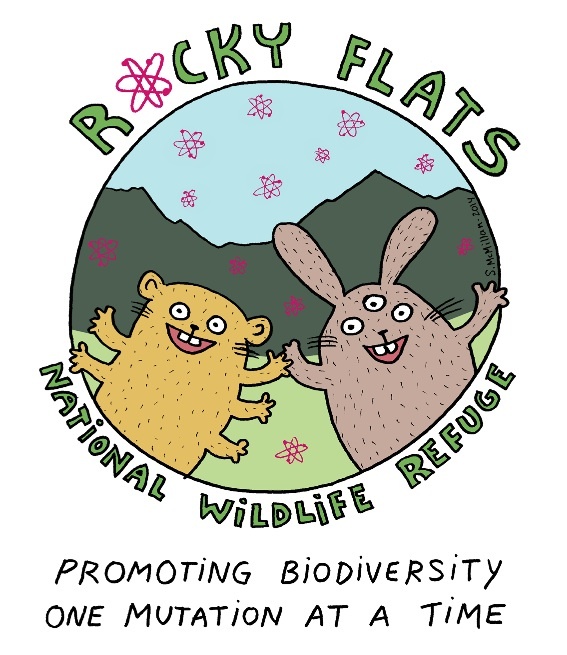 The U. S. Fish & Wildlife Service plans to allow public access to a new “Rocky Flats National Wildlife Refuge”. Will people who visit the park realize the serious danger they face by ingesting or inhaling plutonium dust? Children are especially vulnerable to plutonium exposure. Meanwhile private developers are looking to build a highway (The Jefferson Parkway) and new suburbs in the area (Candelas). All three developments present serious public health threats. The DOE regards the Rocky Flats “cleanup” as a model for what should be done at other DOE sites. This unfortunately perpetuates a problem harmful to the public. Given the condition at Rocky Flats, we propose that all DOE Superfund sites remain closed to the public for at least 200 years after completion of the Superfund cleanup. This will better protect the public, allow fuller evaluation of health effects of contaminants in the environment and take advantage of likely changes in standards for permissible exposure to toxins. The author of this proposal is Harvey Nichols, emeritus professor of biology, University of Colorado. Check out the programme for both activists meetings and the Arvada Center’s Rocky Flats Then and Now: 25 Years After the Raid event. Come next weekend to the make sure that the plutonium contamination at Rocky Flats is not whitewashed from our historical memory a mere 25 years into the 250,000 years that this material will remain toxic for humans. Help the Rocky Mountain Peace and Justice Center stop the proposed wildlife refuge, the Jefferson highway and the Candelas housing development.